Golfers often try to to silence the incessant rattle of their clubs with towels, head covers, and all manners of jerry-rigging. To help save them from the madness caused by the clinking and clanking, OGIO has come up with the Silencer system. As a golf executive, Gocke saw a problem to solve and saw potential profit in the solution. “After about eight months of trying to solve how to tighten around the shafts firmly enough for the clubs to not move, we had an engineer tell us the only way to keep the club heads from twisting was to lock the bottom of the club in place,” he said. “Just the slightest pressure on the bottom of the grip and the top of the club head wouldn’t turn at all. 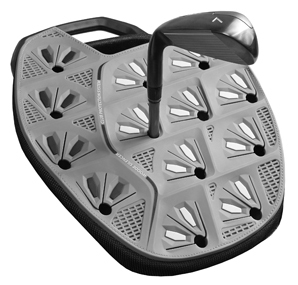 Wow, how had we not figured that one out yet?” The inspired OGIO golf design team developed a flexible locking system that prevents clubs from twisting and accommodates multiple sizes of grips. In order to prevent clubs from moving laterally, the company collaborated with a plastics expert to create a custom membrane overlay to keep them in place, but not inhibit taking clubs in and out of the bag. The company offers the silencer in both a cart and a stand bag. For players who like to walk the course, the company has incorporated SHOXX X4 straps, which act like bungees and help balance the weight of the bag 50/50 on each shoulder. That better balance should prevent fatigue and back pain.